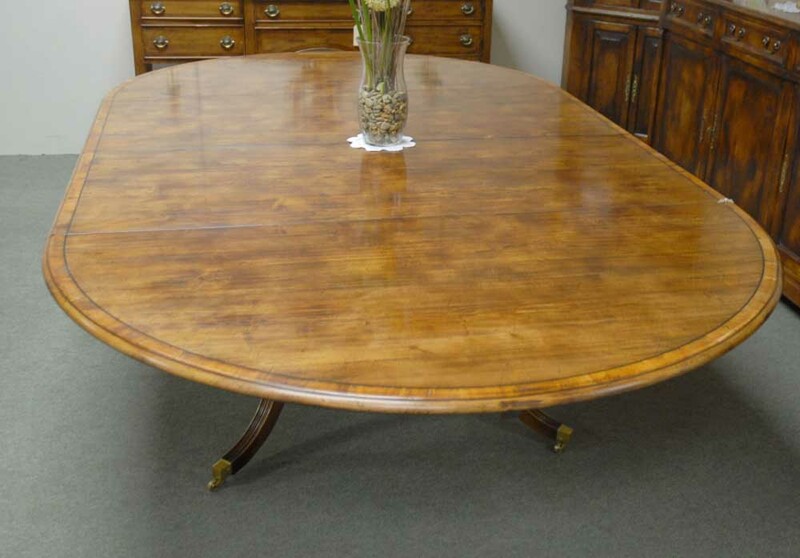 You are viewing an exquisite Italian marquetry dining table in burr walnut that stands in at an impressive twelve feet long when fully extended. I hope the photographs do this stunning work of art some justice, it’s certainly more impressive in the flesh and would make a sumptuous addition to any home interiors scheme. It’s hard to know where to start when describing. The table has three leaves each measuring 24 inches long – so the great thing is you can use this in various different occassions. It’s perfect for large upscale dinner parties. You can even have it small with just the two ends together. The table extends by the handle which you turn, it’s really easy to use. Please see close up photo. 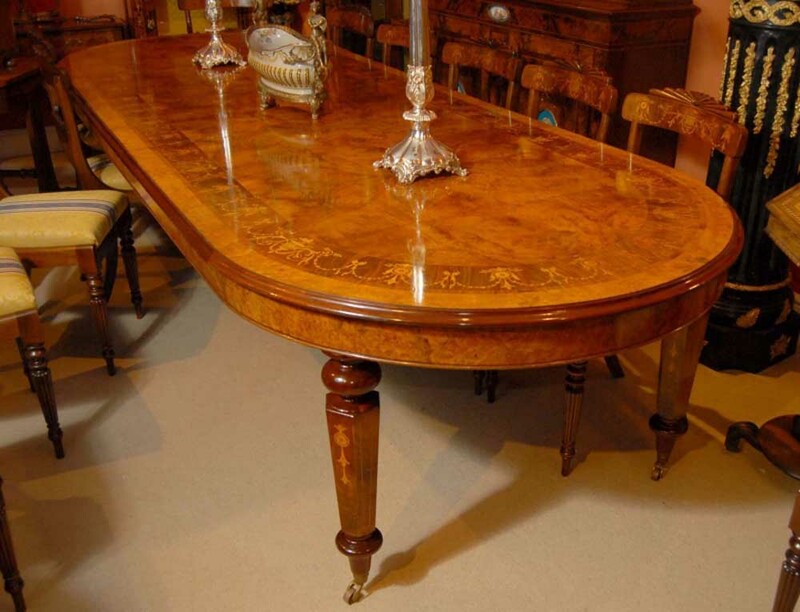 The table has extensive marquetry work on all surfaces. This type of marquetry comes from the Amalfi coast of Italy where skilled artisans have passed the knowledge down through the generations. It’s really breathaking. The designs include urns, swags, garlands and other arabesques – each would have been hand cut from the softer fruitwood and then embedded into the main structure of the walnut. A timely process all done by hand. 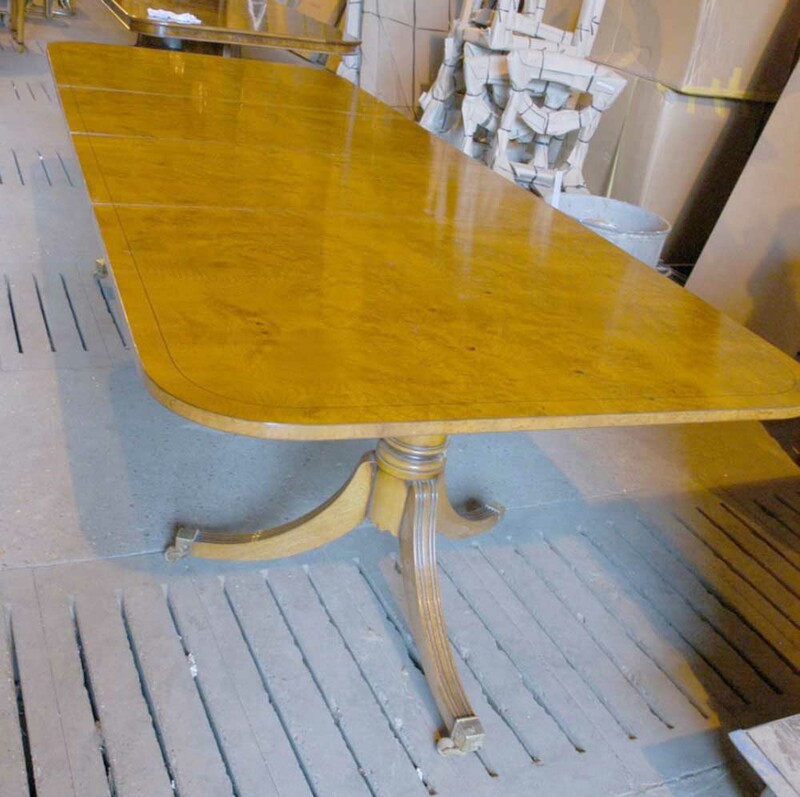 There is even inlay work on the octagonal legs and the sides of the tables. The legs are on castors so it is easy to move this around. The table is solid and sturdy – there are no scratches or dings to the finish. This is offered ready to use right away. This is palatial – fit for a King..and Queen. We appreciate it is quite an initial outlay but this is a great investment, it will serve you for generations hence making it a good investment. In a world where everything is mass produced it’s charming and reassuring to know there are still goods like this which are hand crafted pure quality. We have shown it with a set of matching chairs we also have available and can sell as a set – please email if you are interested. We bought this from a dealer on London’s Pimlico Road and will ship to anywhere in the world. 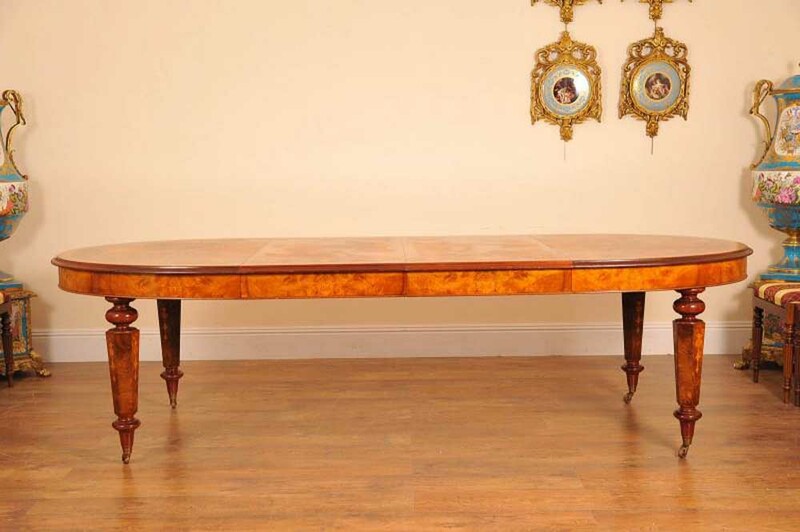 Here it is, the ultimate in dining style, a perennial classic in the shape of a nine foot Victorian style dining table. This has been hand crafted from the finest mahogany and I hope the photos do this stunning work of art some justice. 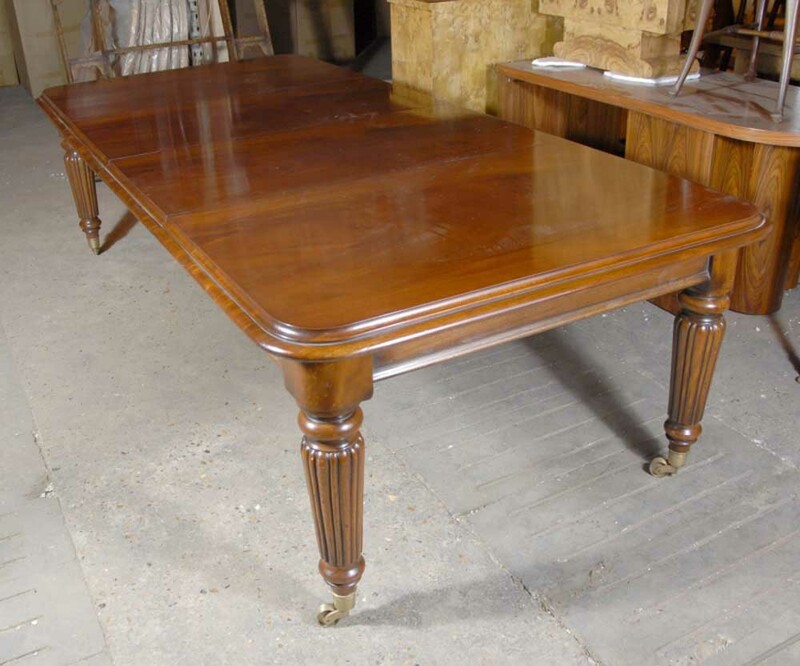 It has the classic Victorian chunky legs with fluted columns. These are on brass castors so it is easy to move around. The table extends via the pull out slat system which is very easy to use and great as you can adjust the size to suit your needs. Large scale dinner parties and more intimate dining are easy with this classic. It has two leaves which measure two feet each. We have pictured it with a set of Chippendales available – please contact us if you are looking for a dining set fit for a king. 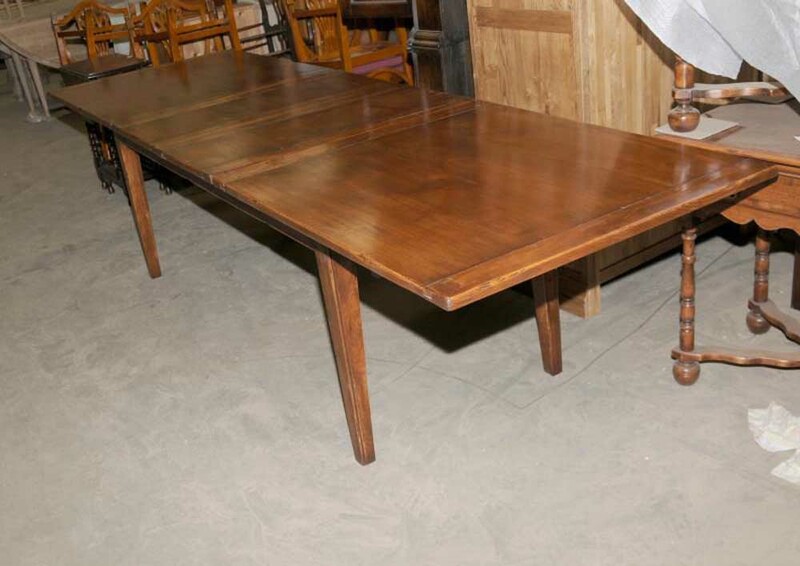 You are viewing a gorgeous pollard oak Biedermeier extending dining table that measures over ten feet when fully extended. 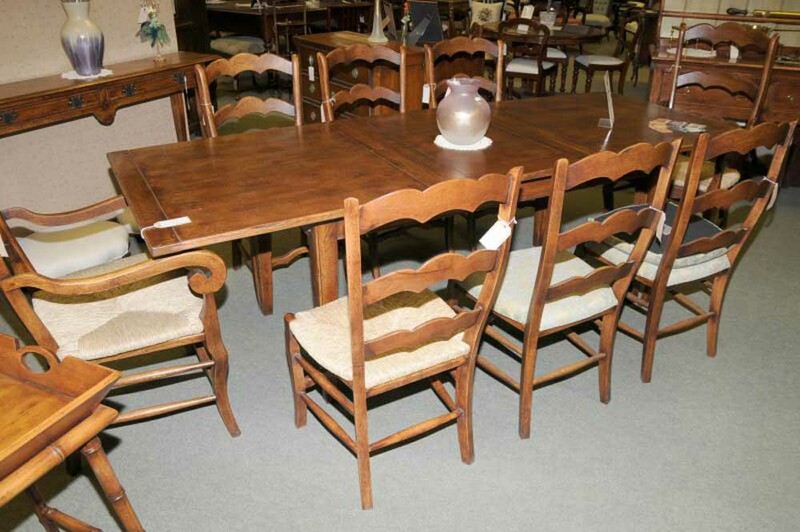 Hence, this large table can sit 12 people quite comfortably, making this a great piece for lavish dinner parties. I hope the photos do the table some justice, it’s certainly better in the flesh. The look and design has a clean and simple feel true to the Biedermeier aesthetic, further accenuated by the black ebonized wood trim to the perimeter of the table. The grains and whorrls of the oak have come out a treat and the finish is offered in great condition with no scratches or other damage. The table is solid and sturdy with no wobbles. It sits firmly on the two pedestal legs on castors so it’s easy to move around. 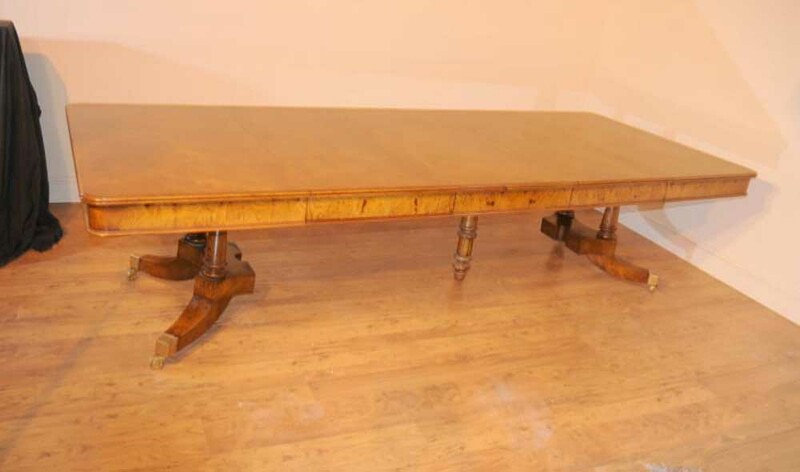 It has two leaves each measuring 24 inches, so when unextended the table is 73 inches long. We have various chairs to match so please email if you are looking for a set. We would of course offer a great discount for buying both table and chairs. Happy bidding! This is a solid piece and will offer you many generations of happy use. 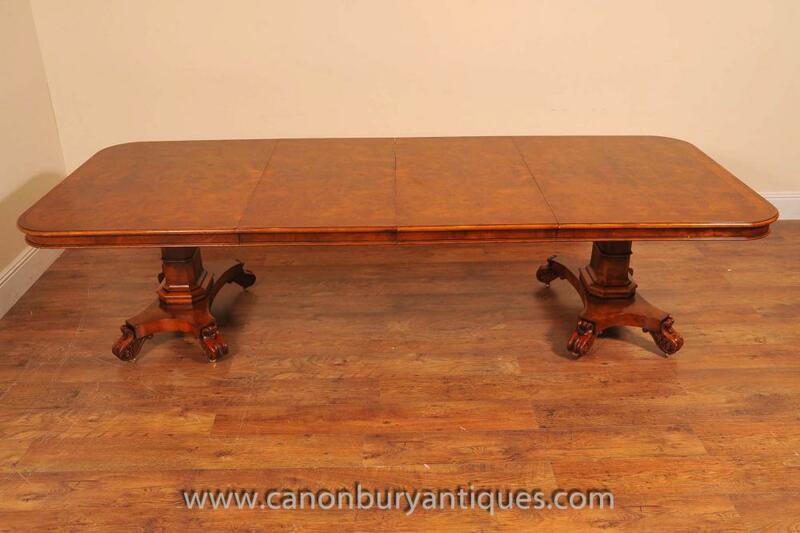 You are viewing a gorgeous French provincial two leaf dining table in cherry wood. I hope the photos do this gorgeous piece some justice, it’s certainly more impressive in the flesh and would make for a great addition to any home dining scheme, both kitchen and more formal. When fully extended with the two leaves this is 8 foot long. Each leaf is 2 foot- so this is four foot when unextened and reduces to an oval shape. That’s the great thing, these tables are really flexible for different needs. For a bigger dinner party this can seat 8-10 people when extended. We bought the table in Avranches, France whilst on a buying trip in Normandy. It is offered in great shape, solid and sturdy and ready for home use right away, no wobbles to the joins and a great finish. We will ship to anywhere in the world. Email us if you are looking for matching chairs also.